← The Isle of Barra. Is Detroit near by? The Perfect Clara Haskil , continued. The outbreak of World War II once again halted Haskil’s career. Caught in occupied Paris, she escaped to the free zone in the south with a group of musicians from the Orchestre National de France, as recounted by the conductor, Désiré Inghelbrecht: We left Paris at night from the Gare Montparnasse, which was plunged into murky darkness, and before dawn we left the train at Angoulême. Our luggage had gone ahead of us, since, as we expected to have to do a lot of walking, we did not want to be heavily laden. In the sinister railway station, cold and dark, we huddled together, speaking in hushed tones; then we met the guide who was to lead us through fields and woods to the free zone. A taxi drove us to the edge of a forest, where we listened to the scarcely reassuring advice of our guide. He was obviously frightened and told us that the prisons in the neighbourhood were full of people like us who had been caught. One road was especially dangerous; we had to crawl across it for, not very far away, as we could see, was a German police station. It was the end of march. The wind was cold but spring had come; there were violets in the woods and birds were singing, but we were not in a mood to enjoy that particular morning walk. On every signpost was a skull and crossbones and a menacing warning to anyone who ventured into this forbidden zone. Our guide wheeled his bicycle ahead of us and we followed in a single file. Le Guillard carried his viola and Clara’s suitcase since she, after a night without sleep, was physically and emotionally exhausted. Each of us wore several overcoats and my wife carried our cat in its basket. Our hearts beat wildly; at last we had crossed that terrible road. I remember the exact moment that our cat started miaowing our guide showed us the road we should take to rejoin the railway; he claimed his fee, mounted his bicycle and rode off as fast as he could. In Marseilles in 1941 Haskil began to suffer from double vision accompanied by severe headaches, which turned out to be a tumour pressing on the optic nerve. A doctor was smuggled out of Paris to perform an operation, which against all odds worked. When news came that the Germans were about to occupy to Switzerland with the help of admirers. Clara Haskil’s first performance in England took place in 1926 with Sir Hamilton Harty and the Hallé Orchestra. Her next appearance on those shores was 20 years later in 1946 at the Wigmore Hall to great acclaim. Sir Thomas Beecham heard some of her six recitals for the B.B.C. the same year and immediately engaged her to play several Mozart concertos with him. Six years elapsed before she appeared in London again, this time with the London Mozart Players conducted by Harry Blech, followed by many other performances there. Particularly noteworthy were the four concerts she gave with the Philharmonia Orchestra in the 1958-59 season, conducted by Colin Davis and Carlo Maria Giulini. After hearing her at the 1954 Salzburg Festival, Hans Keller wrote: “Haskil played Mozart’s great A major K. 488 without showing off either her virtuosity or her lack of exhibitionism: the rarest of achievements in a solo artist.” When she performed the same concerto in 1958 at the Royal Festival Hall in London, the Times critic observed that“she simply expunged from the concerto what was eternal.” Those who heard Clara Haskil perform will never forget the audience hush to a silence as she bowed and approached the platform with almost a floating step, then crouched over the keyboard to coax sounds of unearthly beauty from the instrument. It is a miracle that this frail woman, despite so much suffering and so many setbacks, reached the pinnacle that she did. Clara Haskil never taught and often insisted that she would not know how. In the few times she heard me, I learned more from her than from any other teacher before or since. On one occasion I had difficulty starting the Mozart G Major Concerto K. 453 and was never satisfied with the Eingang. She impatiently pushed me from the chair, and said, “But it doesn’t start … .” As she sat down the music materialized as if from nowhere. Her arm seemed to glide over the keyboard without any preparation, just as a flat stone skims across the water. This was so typical of her playing; nothing seemed to start or end, and everything became timeless. On another occasion I played the first movement of the Schubert B flat major Sonata, D. 960 for her. Throughout the movement the chord above the bass trill ends in an eighth note, the same value as in the bass. However, five bars from the end Schubert writes a quarter note in the right hand while retaining the eighth in the left. Almost every pianist ignores this subtle change and releases the right hand with the left, but not Clara Haskil. “You played the chord an eighth too short,” she exclaimed. “So” I replied. “After all, it’s only an eighth.” “Ja, aber ein Achtel Ewigkeit …” (“Yes, but an eighth of eternity …”). Clara’s playing was intriguing to watch. Her very large hands, white as alabaster, skimmed over the keyboard with consummate ease. I have never seen a thumb as long as hers; some of her colleagues nicknamed it “the fastest thumb in the West.” She could easily strike a 13th simultaneously or a 12th with 5-2. On one occasion Dinu Lipatti listened to Clara read through the slow movement of Schubert’s A Minor Sonata, D. 784, which has several large chords, including 13ths, that Schubert asks to be arpeggiated. Lipatti said he couldn’t understand how she arranged the chords so as not to have to spread them. She replied, “But I don’t arrange them. I take all the notes with the left hand,” whereupon Lipatti exclaimed, “Clara, your hand is larger than any man’s.” She was so embarrassed from thereafter she always arpeggiated the chords. Even though stories of Clara Haskil’s phenomenal memory came from such famous conductors as Hermann Scherchen, Hans Rosbaud, and Herbert von Karajan, I often thought they must be exaggerated. However, a personal experience convinced me that all these stories were true. In the summer of 1957 she was to come to my home in London to practice at 11:00 in the morning. I sat at the piano playing through the first four pages of a new composition of mine, adding a few touches here an there, when a silhouette appeared against the window. It was 10:40, so I thought it could not yet be Clara. However, when I peeped through the lace curtains to see the intruder, it was Clara, looking lost. She apologized for being so early – her hotel was closer to my house than she had realized, and she arrived early. She came to my house two years later and asked, “By the way, whatever happened to the piece you were composing a few years back?” With that she sat down and performed those first four pages with every detail and nuance as I had played it, not knowing, of course, of the few changes I had made since. I couldn’t believe my ears. Later, other pianists took months to learn this complex piece in an Eastern idiom. Clara could not have seen the music because I had removed it from the piano before the first visit. The piece was completed and published only after the second visit. 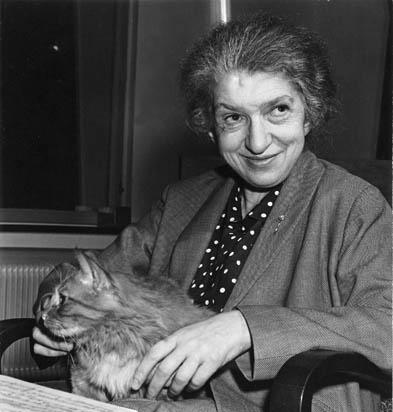 Haskil traveled to Brussels with her sister, Lili, in December 1960 to begin a concert tour with the Belgian violinist Arthur Grumiaux, arriving a few days after a triumphant concert with him in Paris. She lost her grip and tumbled down a steep concrete stairway at the railway station. Rushed to the Clinique Longchamps, Clara was unconscious. Doctors fought to save her life; she came around briefly and spoke to Lili and her younger sister, Jeanne, who had been quickly summoned from Paris. She asked them to tell Grumiaux how sorry she was not to be able to play with him the next day. Holding up her hands weakly, she whispered with smile, “At least I didn’t damage these.” In the early hours of December 7, 1960, exactly one month before her 66th birthday, Clara Haskil died. Note from R.E. I am extremely grateful to my friend and inveterate collector of important memorabilia, David Waterhouse for unearthing this inspiring article from his library of writings on music. My introduction to the art of Clara Haskil is related in Clara Haskil and Arthur Grumiaux: The Elegance of Great Art.